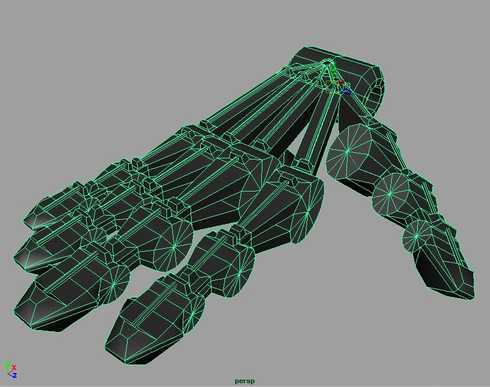 This will cover modeling the hand, starting with a polyCylander. Create a 12 sided cylander and rotate 90 dgrees on Z axis. Select three faces and extrude them. Flatten and move them as shown in the .gif below until you have a cool design. Scale the front smaller so that it will look like it fits into the next finger. Extrude flanges on top for the 'cables' to go through later, and parent a cylander to the top as shown. Duplicate the finger and cable and move it forward. I made another cylander and rotated it 90 degrees on the Z axis as well for the wrist. The rest was done with scaling the points and using the SoftenHarden edges tool . I extruded a cube to make the connecting tendons and the thumb root. See Below. Figure A. Rough Construction Process. Figure B. Completed basic model. Figure C. Note the half torus with black shader to simulate a hole. It would be wise to texture the first finger and rod BEFORE duplicating it over and over, as it will be much harder later and very repetitious. Also, delete the history on the hand when you have placed all the fingers where you want them are are done with altering them. Do NOT delete the history after the next step. This will cover setting up the rods over the knuckles, and linking them to setDriven keys. 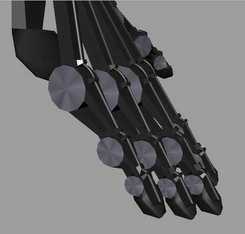 This will help create the 'illusion' that the rods or cables are "controlling" the fingers. Later we will use setDriven keys to animate the endSweep setting so that it stays on the first knuckle. You can duplicate this torus with downstream connections, and snap it to all the other fingers (15 in total). 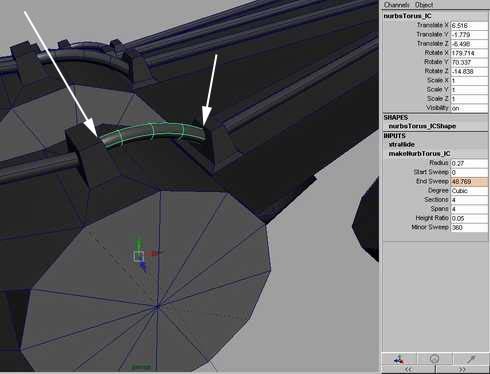 Tweek all the torus radius and minorSweep settings, and edit the poly "Cables" so that all the cables look connected, especially at the end points. At this point, I would parent everything together. Be sure NOT to delete the history on anything that the Torus' are linked to, as this will kill all the animatable parameters for later. 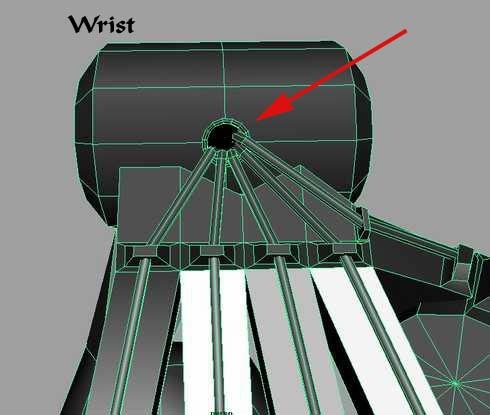 Once you get it all linked, move all the torus' pivot points to the center of where they touch the knuckle. This will be used for later. Move pivot from finger center to knuckle contact point. Now you can move the hand to the arm and rotate it into position. I linked it to the forarm, which simulates a bend starting at the elbow, but whatever works for your model. 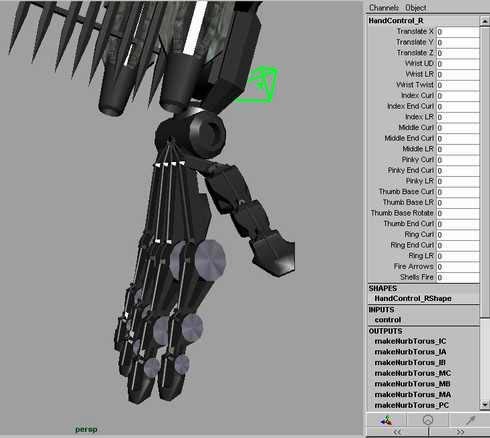 I had an IKhandle linked to a polyCube which I will use to position the arm / hand, and to put the fingers controls on (See figure C below). If you are using forward rotation, make a cue that you can add some attributes to, disconnect it from the shading group(it won't render in hardware shading) and link it to the wrist.